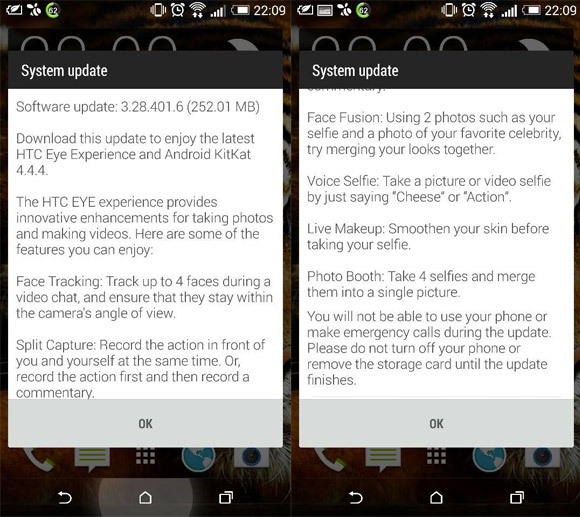 Just two days after announcing the Eye Experience software, which ships with the new HTC Desire Eye, the company has also launched an update for the HTC One (M8) to bring it up to speed. The Eye Experience is coming to the One (M8) alongside Android 4.4.4 KitKat, which also contains some security fixes. The Eye Experience improves the One (M8) camera software with some cool features - mostly involving the front-facing camera. You can now track up to 4 faces during video chat and ensure they're within the camera's view angle thanks to Face Tracking. It is followed by the Split capture feature that lets you use the front-facing and rear camera simultaneously. Thanks to the Eye Experience suite, you can take selfies by saying "cheese" or "action" and merge 4 selfies into a single photo by using Photo booth. The firmware version of the update is 3.28.401.6 and weighs 252.01MB. Currently, HTC is slowly seeding the update for unlocked One (M8) units in Europe, but other markets should follow shortly.